Punching out the wheels just a bit more gives performance a staggering improvement, not to mention creates the world’s first factory 72-in wide side-by-side vehicle. With 24-in of suspension travel and advanced FOX Racing components, it stretches the X3 X rs’ abilities far beyond expectations. BRP's four-link TTX suspension with up to 24-in of travel features a trophy truck-like trailing arm and three links dedicated to controlling camber while delivering optimal geometry at all times, even during extended wheel travel. The result? Unparalleled power transfer to wheels, virtually no bump steer, precise steering response, and more confidence at higher speeds. The Maverick X3 X rs' intensity comes from a mix of performance-driven mechanical and structural design, from its signature LEDs to its advanced cockpit. 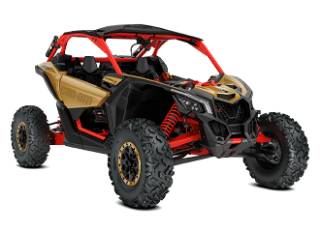 Here, designers have selected hero colors for the top-of-the-line Maverick X3 X rs: choose between Gold & Can-Am Red or Triple Black or Platinum Satin. Keep rolling strong with 14-in aluminum beadlock wheels and 30-in. Maxxis Bighorn 2.0 six-ply tires. Built to withstand rough terrain, sturdy lugs and a non-directional tread pattern ensure a smooth, precise ride. The Maverick X3 X rs is equipped with fully-adjustable FOX 2.5 Podium RC2 PHG Piggyback shocks with bypass and dual-speed compression and rebound (front), and class-leading FOX 3.0 Podium RC2 HPG shocks with remote reservoir with bypass and dual-speed compression and rebound (rear) for ultra-precise performance. For extra protection on our most capable side-by-side vehicle ever, the X3 X rs has 4-point harness, a full roof and a heavy-duty full HMW (High Molecular Weight) skid plate honed to play on rough terrain.